Fresh milk is not only a good source of potassium and calcium for growing children, it is also an important source of income for farmers in rural African communities. Over 750 million people around the world are engaged in milk production, from tending goats to making cheese. But for many subsistence smallholder farmers, who only have the resources to grow enough to feed themselves, dairy farming can yield low results and be difficult to turn into an economical business. Dairy processing, such as milk pasteurization for long-life milk, requires large quantities of equipment, capital and high volumes of milk production. That’s where organizations like the U.S. African Development Foundation (USADF) can make small but vital investments to transform individual dairy producers into a booming collective industry, all while boosting food security. Dairy farming is an important way for farmers to increase their earnings and access to more nutritious food for their families. While subsistence dairy farming provides not only fresh milk and a source of basic income, value-added products, such as yogurt and cheese, provide a higher source of revenue. Through local technical support, USADF works with producer groups to find ways to add value to products so farmers can earn a living wage. USADF dairy sector projects include training local farmers to expand quality animal feed and milk bulking stations so farmers can travel shorter distances to have their milk tested and processed. USADF is teaming up with the Government of Malawi to work with cooperatives like Chitsanzo Dairy Cooperative to improve its financial and business management systems to further increase profits. Since 2013, with the support of a USADF enterprise expansion grant, Chitsanzo Dairy Cooperative members saw a 25% increase in sales revenue. USADF, through initiatives like Feed the Future, has invested over $1.3 million since 2009 in Malawi’s dairy sector to increase production, develop local and export markets, and help farmers earn more income by enhancing milking techniques. In Africa, dairy farming is a major source of income for women. Tending cows allows women to stay close to the household and local village while maintaining their status as income-earners for their families. In Uganda, USADF is investing in dairy enterprises as a transformational value chain to eliminate hunger and diversify the diets of women and children. Initially launched as a small women’s co-op, Gulu Women’s Dairy Cooperative has grown into a major women-owned and operated commercial enterprise. With support from a USADF enterprise expansion grant, Gulu Women’s Dairy tripled its membership and constructed northern Uganda’s first pasteurization plant for value-added dairy products, such as yogurt and long-life milk. As the town of Gulu, once the epicenter of a major insurgency, continues to stabilize, members of Gulu Women’s Dairy Cooperative are not only the breadwinners for their families but also key decision-makers in their community, ensuring no one goes hungry and contributing to local economic activity and food security. In many African communities, there is a strong demand for milk that is produced locally. In countries like Zimbabwe, which imports over half its milk each year, demand for fresh dairy products significantly outstrips domestic production and supply. USADF has made substantial investments in Zimbabwe’s growing dairy sector by increasing domestic production and helping to reduce the import of foreign products. Since 2012, USADF has invested $7 million in Zimbabwean cooperatives like Tsonzo Dairy Association to increase food security and support more than 18,800 farmers in Zimbabwe. 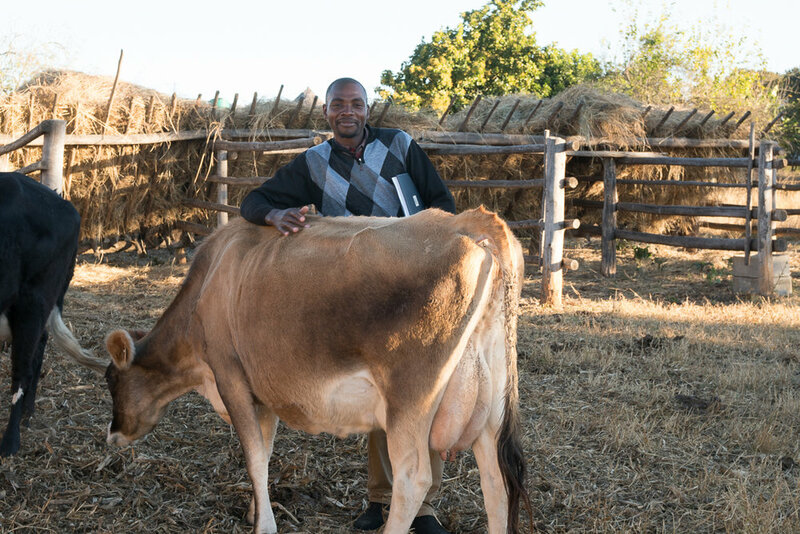 Farmers like Philemon Nyatsana, a young smallholder dairy farmer with Tsonzo Dairy Association based in eastern Zimbabwe, who was able to triple his herd of cows and support his family by selling over 60 liters of milk a day to his community. What’s more, availability of fresh milk from the village is often more affordable for rural families. But smallholder dairy farmers face a challenge: they often have low, uneconomical milk yields, averaging 3 to 5 liters per cow a day. With USADF investments and the introduction of animal health training, improved dairy breeds, better quality feed— all of which contribute to healthier cows— farmers can improve their yields upwards to 15 or more liters per cow a day. In Zambia, Mungaila Dairy Cooperative members had to walk up to 15 miles a day by foot to sell their milk. With the region’s frequent droughts, farmers grew poor-quality animal feed, resulting in indigenous cows producing low yields of milk. With a USADF grant, Mungaila Dairy improved its financial management, built a milk storage tank, and members received access to new breeds with the potential to expand their milk yields as much as tenfold. By the end of the grant’s first year, farmers reported increases in sales as high as 30 percent. With farming families on a pathway to prosperity, an entire community benefits from an increase in dairy farmer revenue and boosted nutrition. When we invest in smallholder dairy farmers and equip them with the tools to become successful, we are investing in entire communities and building lasting stability and prosperity. Mr. Kim Ward is the Managing Director of Programs at the U.S. African Development Foundation, and has over 30 years of experience working in international development.